Finding a course can be hard, especially if you’re not Japanese. Here’s a few places to find manga and sequential, or comic book, art courses around the world. Drawing Boot Camp offers drawing and illustration classes for free for kids. Illustrator and manga creator, Mark Crilley, has his own free online manga course at https://www.keenjar.com/stack/167-how-draw-manga/. Just watch the videos on any aspect of manga and try them out yourself. How to Bam is aimed at people wanting to become manga creators from the West. So far, they’re just free videos and information. The World Manga Academy has free seminars and classes for those interested in learning or teaching the art of manga creation. Their interactive website keeps up with your classes and learning history the same way an online school does. One magazine, Imagine FX (http://beta.imaginefx.com/), has online tutorials on how to color sketches and understand anatomy. They also have an issue called How to Draw and Paint Manga on Issuu.com (you can also find many free art magazines). You can read it for free at http://issuu.com/riky1988/docs/how_to_draw_and_paint_manga. The Center for Cartoon Studies, also known as Cartoon Studios, offers Vermont-based workshops and classes, but for their free how-to guide for doing comics, download it or read it on Issuu here. You can also earn a Masters of Fine Arts in Cartooning. If you’re looking for how to draw specific things like monsters and anime characters, check out Paradise Manga‘s How to Draw Manga Course at http://paradisemanga.com/ga/how-to-draw-manga/how-to-draw-manga-course/ . 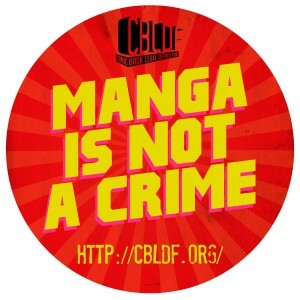 The Deleter Manga Shop has a webpage on manga techniques in English at http://www.deleter.jp/eng/deleterclub/mangatechnique/index.html . While you’re there, you can also purchase Deleter-brand manga supplies (which are cheaper in my personal opinion). Check out the “Deals and Savings for Manga Artists” post. CourseHorse, an online hub for various classes in Los Angeles, New York, and Chicago, has several listings for manga and cartooning classes. The prices include more than one class most of the time, but each class fills up fast. Find listings in Los Angeles, New York, or Chicago. U.S.-Japan Creative Artists Exchange Fellowships are federal grants for artists to exchange culture and experiences with Japanese counterparts. Deadline to apply is February 1, 2018. To learn more about the program, visit http://www.jusfc.gov/creative-artists-programs. Manga University, known for their How to Draw Manga book series, offers a home study course ($39.99 or $49.99). There are no instructors, only PDFs and a lot of words, but the information is great for beginners and people who’ve never taken a high school art class. Check it out at http://www.howtodrawmanga.com/pages/home-study-course. I did purchase this home study course to see how it fared against other courses. I wrote about my experience with the Manga University here. Similar to Manga University, Cotty Kilbanks (cartoonist/artist for Rocko’s Modern Life and Iron Man) on Craftsy has a home study manga course called Drawing Anime Style through HD videos for a set price. This course is for people who consider themselves intermediate level in 2D drawing. For more information, please click here. Comics Experience, which is attached to Stan Lee’s ComiKaze, has several comic book courses–from script writing to penciling techniques–and all taught through the net. To find out more details, go to http://www.comicsexperience.com/courses.html. CG Master Academy is a specialty online art academy that offers classes for character designs, digital painting, figure drawing, and perspective drawing. Classes are offered all four seasons, and the prices for each one is usually $699. If you plan on doing mostly digital art, this academy is suited for you. Go to http://2d.cgmasteracademy.com/ for more information. The Experiment in International Living has a high school summer abroad program for Japanese arts. It’s a 1-month stay for high schoolers in Vermont, USA. For the program details and price tag, look up http://www.experimentinternational.org/programs/find-a-program/japan/japanimationanime-and-manga/overview/. SAW, or the Sequential Artists Workshop, is a Florida community of artists trying to improve their abilities through classes and workshops. They offer year-long art programs, weekly workshops, and online classes at random times of the year. To check their calendar, visit http://sequentialartistsworkshop.org/wordpress/. On Saturdays from January 12th to February 16th, 2016, SAW will offer a Teen Comics and Manga Class at their location in Gainesville, Florida (SE 5th Ave at Main St, behind Citizen’s Co-op). Mad About Manga! is a manga course run by Malcolm Matheson. This course costs $97 to participate. For more information, please go to http://madaboutmanga.com/. For those online and interested in traditional comic book creations, check out the Comics Workbook (http://comicsworkbook.tumblr.com/about). Not only do they offer lessons on sequential art, but they have a magazine as well. Katonah Art Center in New York offers classes in manga at a cheaper rate than community college prices (usually around $378 to $420 for 10 weeks). Find more information at http://www.katonahartcenter.com/classes/visual-arts/ . Activity Hero offers San Francisco kids and teens art classes, including manga classes such as this Wednesday Cartooning and Manga Class for $325 (January 20th – March 16th, 2016). To enroll, check it out here. Manga Class at Appel Farm is New Jersey-based art class offered through McArt à la Carte geared towards enjoyment and learning. Visit http://mcartshop.com/manga-class-appel-farm/ for more information. University of Chelsea in the United Kingdom offers Comic Book Art courses (around $500 per 3 months). More details at http://www.arts.ac.uk/?_ga=1.128852425.410023993.1449103818 and look for “comic book” under “Course Finder”. The University of British Columbia Vancouver has a summer program in 2015 with 2 manga-related programs, Manga and Anime in the World and Writing for Graphic Forms: Manga. Check out their catalog: http://www.fao.fudan.edu.cn/_upload/article/61/73/4beb64584c1aa58b048129fe9b8a/c1a0f5e9-cc4e-4e86-a8e4-39c1f0b0f692.pdf. If you’re looking for a Bachelor’s degree that specializes in comic and sequential art, try the Broadview Entertainment Arts University in Utah, USA. It is more expensive than most of the other options on this list, but BEAU also offers scholarships for tuition. For more information, please go to http://beau.broadviewuniversity.edu/programs/visual-design-bfa/comic-and-sequential-art-degree. Otis College of Art and Design (LA) has a Drawing Manga course for ages 12 to 17 as part of their Continuing Education disciplines from January 30, 2016 to March 19, 2016. Find more details about the costs and location at http://www.otis.edu/ce-course?crs=344 or check out the Tumbler Otis Manga Class with some free resources. 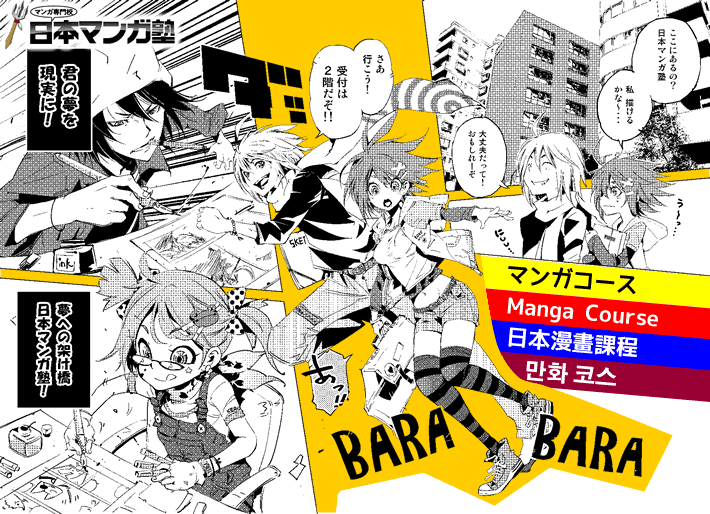 Beppu University Junior College offers a manga course in their Department of World Languages and Cultures. Check out the information here: http://www.beppu-u.ac.jp/general/files/2015英語版.pdf. Kobe Design University has a whole department devoted to the production of manga, the Department of Manga Media. Similar to any vocational art school, the curriculum for this course follows 3 years. For more details, please go to http://english.kobe-du.ac.jp/school-of-arts-and-design/department-of-manga-media/. Kyoto Seika University also has a Manga Production department with 4-year program in all things manga related. They also have courses in becoming a manga editor, manga critic, and assistant manga creator. For details, visit https://www.kyoto-seika.ac.jp/eng/edu/manga/mangaproduction/. If you’re Filipino, you can earn a scholarship to study Japanese at Kudan. For more details, go to https://kudanph.wordpress.com/scholarships/. If you ever drop by or live in Nakano, there is a small manga school that’s run by an artist named Chika. Though there may be a language barrier, as Chika isn’t fluent in English, many of her students say she’s a good teacher who works through the obstacle. 3 days costs 12,624 yen. Check it out at https://www.govoyagin.com/activities/learn-how-to-draw-japanese-manga/1375. Tokie, an artist who’s lived in Osaka most of her life, does 1-hour manga classes for English and Svenska speakers in Japan. She picks up students at the train station and takes them to a sharehouse for lessons. To book her drawing lessons, go to https://www.govoyagin.com/activities/japan-osaka-simple-manga-drawing-lesson-get-your-manga-portrait/2735. Another manga school in Nakano is the Manga School Nakano with Nao Yazawa’s How to Draw Manga Course in English. It is a free course for foreigners living in Nakano. See the schedule at http://www.nakanomangaschool.jp/english.html. WAHAHA Japanese Language School also offers 2-week manga courses at various times throughout the year. To get a quote or more information, go to http://wahahanihongo.com/en/culture#manga. The Yokohama Design College has a 1- to 2-year program for manga with the goal for students to become cartoonists, assistants, and character designers. See their information in English here: (for manga) http://www.ydcjpn.ac.jp/eng/pro/manga. The Center for Study Abroad has an Animated Cartoon Drawing and Conversation Course under Japanese Manga and Language in Tokyo. This course is offered throughout the year in either 1-month-long courses (around $1345) or 3-month-long courses (around $3545). The prices don’t include housing (around $250-$350 per week), but academic credit is available, so if you’re looking to fulfill your Study Abroad credits, this might help. Though 2015-2016 info: http://www.centerforstudyabroad.com/japanese-manga-language-tokyo/. For Indonesian residents, there’s the Dr. Vee Mangaka Club hosted by Dr. Vivian Wijaya (first professional Indonesian manga creator published in Shonen Sunday). For the calendar of events, please go to http://www.drveemangakaclub.com/. Another Indonesian-based manga school is the Machiko Manga School run by, you guessed it, Machiko-sensei. This school has been recognized by the Ministry of Education and Culture of Indonesia. This school also uses equipment and supplies directly imported from Japan. For more information, go to http://machikomangaschool.tumblr.com/en. For Australian citizens, the Japanese Melbourne Language School offers 2-week-long or more home stay programs in conjunction with Mangajuku to learn manga drawing and Japanese. Head to http://www.japanesemelbourne.com.au/study-in-japan/studying-in-tokyo/ for more information about fees and housing. Human Academy brought their manga specialization course to France in 2015. For more information, please visit http://eu.athuman.com/en/ . Southern Maine Community College has a course called Comics & Sequential Art that explores comics’ role in today’s society. This class starts in January 2015 . Check out the details here: https://my.smccme.edu/ICS/Academics/ARTH/ARTH_185/1415_SP-ARTH_185-R1/Course_Information.jnz. If you’re looking for screentones, please try Screentones for Manga Artists Outside Japan page. One thing I like about living in Japan: I can read Japanese manga technique books for free. The book I picked up from the school library was Tokyo Institute of Animators’s 思いいどおりのキャラが描けるテクニックBOOK, or Character Technique Book (literally “techniques so that one can draw the expected character”). Character Technique Book is a 単行本, or tankoubon, meaning “special volume” usually from a series of lectures. This book’s best aspect: showing how to draw people, weapons, animals, and places from the preliminary sketches to the finished product. Even how to color pictures (digitally and traditionally) is outlined. For all emerging comic artists (and those who can read Japanese), I would recommend this book. There are also other technique books like this such as Cool Male Characters Technique Book (loose translation of カッコいい男のキャラの描けるテクニックBOOK) and Cute Girl Characters Technique Book (loose translation of かわいい女のキャラの描けるBOOK). 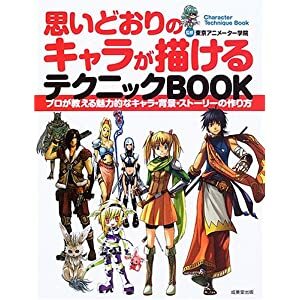 Character Technique Book is available for 1050 yen on Japan’s Amazon website. You can also find this book as How to Draw Manga Character Background Technique Book on Amazon.com for $33.18.